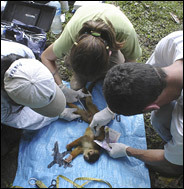 From left, Grace Wong, Dr. María Fernanda Mejía and Gustavo Gutiérrez-Espeleta working on a squirrel monkey in December in the Corcovado National Park near the Pacific coast of Costa Rica. SAN JOSÉ, Costa Rica — Eduardo Carrillo was on a field trip to Corcovado National Park with a group of his biology students last November when he realized that something was wrong. In just over a mile, the group found five dead monkeys. Three more were in agony, he said later — emaciated, near death, sitting on the forest floor unable to climb a tree. "I had never seen something like this," said Dr. Carrillo, a wildlife ecologist at the University of Costa Rica. At first he suspected yellow fever, which swept through monkey populations in the 1950's. So he hurried back to San José, the capital, and convened a team of scientists, which included wildlife biologists, a microbiologist, a geneticist and a veterinarian. Tourists in the park, a relatively remote 212-square-mile tropical rain forest preserve that stretches along the Pacific coast and inland, reported sightings of other dead animals, including deer, toucans, macaws and sloths. In mid-November, park officials closed Corcovado to visitors after tourists, despite warnings not to handle wildlife, began bringing sick animals to ranger stations in the hope of saving them. Dr. Carrillo and his colleagues, as well as government officials, worried they might have a mini-epidemic on their hands. But tissue samples from Corcovado spider monkeys — Costa Rica's most endangered species of monkey — sent to a laboratory at the University of Texas for analysis showed no evidence of a virus or other pathogen. The story of what really happened in Corcovado, or at least the prevailing theory, is less worrisome in the short term than a disease outbreak, but it has the potential to be deadly serious. Costa Rican researchers think the affected animals starved to death because of a lack of available food sources and an inability to forage for food during several months of extreme rain and cold. September, October and November brought excessive rainfall, nearly twice the monthly averages, and unusually low temperatures to many parts of Costa Rica, especially the Osa Peninsula, which juts into the Pacific in the south. Corcovado averages about 24 inches of rain in September, 31 inches in October and 20 inches in November. In 2005, more than 39 inches fell in the park in September, 59 inches in October, and 41 inches in November. While it is impossible to know if the weather in late 2005 is related to climate change, the Costa Rican team studying Corcovado worries that if the climate changes and produces more extreme weather events like this, animal populations may not bounce back easily, said Gustavo Gutiérrez-Espeleta, a wildlife population geneticist at the University of Costa Rica. The weather caused several problems for the monkeys. Some fruit trees did not bear fruit during the rainy months. Others produced fruit but it fell to the ground early, leaving nothing on the trees for long periods of time.